This entry was posted on November 8, 2013 by B4S. 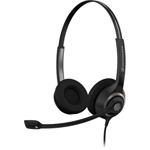 Wired Telephone Headsets come with a range of high end advancements which make the wearing and operation of headsets in a small office or large business an experience of comfort and quality. The Sennheiser CC550 headset is the perfect choice for a noisy environment. Anyone who has read our blog post on choosing a telephone headset will be aware that in a busy, noisy workplace such as an open plan office or call centre a binaural ( two eared ) headset is advised. It is for workers who communicate primarily ( if not solely ) with clients rather than colleagues. The CC550 not only protects you from background noise via its comfortable padded leatherette headphones but also incorporates ActiveGuard© technology to minimise the risk of acoustic shock. The headset also has a fully adjustable noise cancelling microphone with a Teflon washer - preventing extraneous sounds from being transmitted. The adjustable headband is new age - with separate ball mounted ratcheted positioning either side giving a great comfort for the operator. This is a similar headset, binaural and noise cancelling but at a lower price, they are famously durable and lightweight whilst providing astonishingly high levels of sound quality. 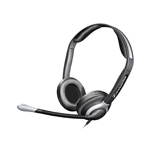 The Headsets above are some of our top selling wired headsets these days, Sennheiser may be a relative newcomer to business communications but their products compare very favourably with more established manufacturers - see here for our entire range of Sennheiser Wired Headsets.